Due to the past high threat of animal epidemics like swine fever, avian influenca or aphthous fever the German states decided the acquisition of a shared mobile epidemics control centre that can quickly be transported to the usage site, if necessary, also independently of public mains supply. 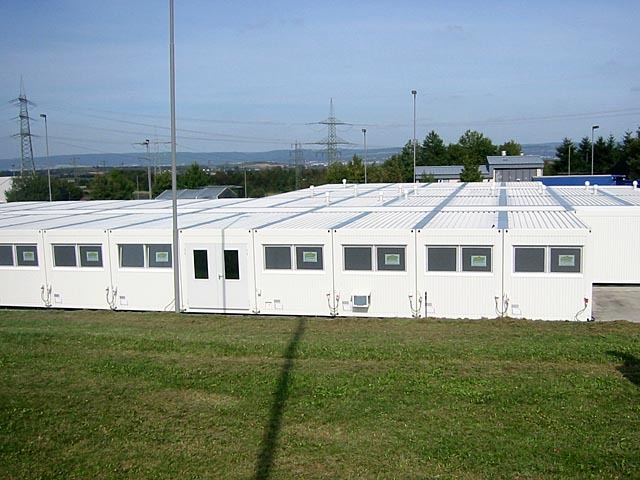 Container construction is optimally suitable for the use as mobile control centre. The 40 room modules can be installed at almost each location in a short time period and, after termination of all measures, be disassembled without any problems. The animal epidemics control centre serves as station for up to 200 people. It comprises office, communication and hygienic units. The costs for the purchase of the centre were borne by the states. The containers are stationed in Lower Saxony and can be retrieved for the according use. The centre was designed by the Bundesamt für Wehrtechnik und Beschaffung (Federal Office for Defence Technology and Procurement).